This article provides best practices for Security Gateway performance. Chapter 1 "Background" - provides a short background on performance of Security Gateway. Chapter 2 "Introduction" - lists the relevant definitions, supported configurations, limitations, and commands specific to a product. Chapter 3 "Best practices" - provides the recommendations and guidelines for achieving the optimal performance. Chapter 4 "Initial diagnostics" - lists the basic commands and guidelines for checking the current utilization of machine's resources. Chapter 5 "Advanced diagnostics" - lists the advanced commands and guidelines for checking the current utilization of machine's resources. Chapter 6 "Command Line syntax" - provides the complete list of commands and their options specific to a product. Chapter 7 "Examples" - provides real-life examples. Chapter 8 "Related documentation" - lists the relevant documents. Chapter 9 "Related solutions" - lists the relevant solutions. Performance Pack is a software acceleration product installed on Security Gateways. Performance Pack uses SecureXL technology and other innovative network acceleration techniques to deliver wire-speed performance for Security Gateways. SecureXL is implemented either in software, or in hardware (SAM cards on Check Point 21000 appliances; ADP cards on IP Series appliances). Affinity - Association of a particular network interface with a CPU core (either 'Automatic' (default), or 'Static' / 'Manual'). Interfaces are bound to CPU cores via SMP IRQ affinity settings (refer to sk61962 - SMP IRQ Affinity on Check Point Security Gateway). Note: The default SIM Affinity setting for all interfaces is 'Automatic' - the affinity for each interface is automatically reset every 60 seconds, and balanced between all available CPU cores based on the current CPU load. FWACCEL - FireWall Accelerator (acceleration feature). SIM - SecureXL Implementation Module (acceleration device). Note: In ClusterXL High Availability, the connections are not offloaded to SecureXL on Standby member. Connection notification - SecureXL passes the relevant information about the accelerated connection from SecureXL Connections Table to Firewall Connections Table. Partial connection - Connection that exists in the Firewall Connections Table, but not in the SecureXL Connections Table (versions R70 and above). Such connections must be offloaded to SecureXL, since packets in these connections must not be dropped. If a packet matched a partial connection in the outbound, then it should be dropped. Delayed connection - Connection created from SecureXL Connection Templates without notifying the Firewall for a predefined period of time. The notified connections are deleted by the Firewall. Anticipated connection - Connection that is anticipated by SecureXL based on policy rules to avoid dropping it by Drop Template. Any FTP connection that will be opened will be accepted. A SYN packet of a Telnet connection will be dropped and a Drop Template will be offloaded to SecureXL. The FTP Data connection FTP might match this Drop Template and will be dropped. SecureXL will offload such connections (in this example, FTP Data) and will mark them as anticipated. SecureXL will try to match an anticipated connection to an existing connection or an existing Accept Template. If such match was found, the packet will be forwarded to the firewall and will not be matched to a Drop Template. Note: Size of Templates table (cphwd_tmpl, id 8111) is limited to 1/4 of the size of Firewall Connections Table (connections, id 8158). 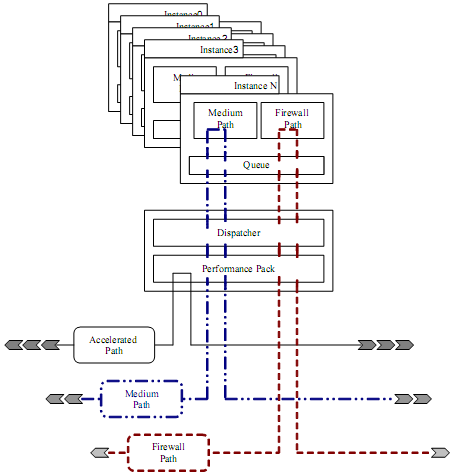 Accelerated path - Packet flow when the packet is completely handled by the SecureXL device. It is processed and forwarded to the network. Medium path (PXL) - Packet flow when the packet is handled by the SecureXL device, except for IPS (some protections) / VPN (in some configurations) / Application Control / Content Awareness / Anti-Virus / Anti-Bot / HTTPS Inspection / Proxy mode / Mobile Access / VoIP / Web Portals. 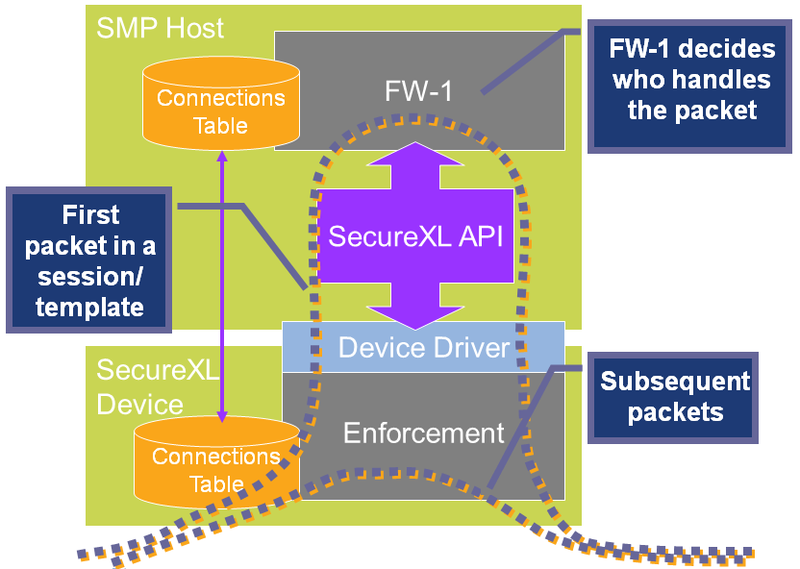 The CoreXL layer passes the packet to one of the CoreXL FW instances to perform the processing (even when CoreXL is disabled, the CoreXL infrastructure is used by SecureXL device to send the packet to the single FW instance that still functions). Firewall path / Slow path (F2F) - Packet flow when the SecureXL device is unable to process the packet (refer to sk32578 - SecureXL Mechanism). The packet is passed on to the CoreXL layer and then to one of the CoreXL FW instances for full processing. This path also processes all packets when SecureXL is disabled. Active Streaming (CPAS) - Technology that sends streams of data to be inspected in the kernel, since more than a single packet at a time is needed in order to understand the application that is running (such as HTTP data). Active Streaming is Read- and Write-enabled, and works as a transparent proxy. Connections that pass through Active Streaming can not be accelerated by SecureXL. Passive Streaming - Technology that sends streams of data to be inspected in the kernel, since more than a single packet at a time is needed in order to understand the application that is running (such as HTTP data). Passive Streaming is Read-only and it cannot hold packets, but the connections are accelerated by SecureXL. Passive Streaming Library (PSL) - IPS infrastructure, which transparently listens to TCP traffic as network packets, and rebuilds the TCP stream out of these packets. Passive Streaming can listen to all TCP traffic, but process only the data packets, which belong to a previously registered connection. For more details, refer to sk95193 - ATRG: IPS. QXL - Technology name for combination of SecureXL and QoS (R77.10 and above). F2F / F2Fed - Packets that can not be accelerated by SecureXL (refer to sk32578 - SecureXL Mechanism) are Forwarded to Firewall. F2P - Forward to PSL/Applications. Feature that allows to perform the PSL processing on the CPU cores, which are dedicated to the Firewall. SAM card - Security Acceleration Module card (Acceleration Ready card). Connections that use SAM card, are accelerated by SecureXL and are processed by the SAM card's CPU instead of the main CPU (refer to 21000 Appliance Security Acceleration Module Getting Started Guide)). ADP card - Accelerated Data Path card. Connections that use ADP card, are accelerated by SecureXL and are processed by network processors (NP) instead of the main CPU (refer to sk60508 - How to Configure ADP & SecureXL on IPSO). IRQ Swizzling - Traditionally, in a PCIe bus, all PCIe ports are mapped to one interrupt. Swizzling allows the PCIe slots to be balanced across four interrupts instead of one (enabling IRQ Swizzling requires a BIOS update). For limitations of traffic acceleration and templating, refer to sk32578 - SecureXL Mechanism. SIM Affinity is applicable only to physical interfaces (VLAN / Bond interfaces are influenced by the "physical" decision). Note: Some systems may require BIOS update to enable IRQ Swizzling and EIRQ technologies. To determine whether a specific system supports the required technology, contact your hardware vendor. On VSX Gateway, WARP interfaces can not be assigned to a CPU core. SecureXL NAT Templates are supported only in R75.40 and above (sk71200). SecureXL Drop Templates are supported only in R76 and above (sk66402). SecureXL Optimized Drops feature (used for DoS/DDoS protection) is supported only in R76 and above (sk90861). SecureXL Penalty box feature (used for DoS/DDoS protection) is supported only in R75.40VS and above (on VSX Gateway, the penalty box would only be enforced on Virtual System 0) (sk74520). SecureXL does not support Point-to-Point interfaces (PPP, PPTP, PPPoE). Note: In case a PPP-interface is detected, SecureXL disables itself on that interface (sk79880). ClusterXL Sticky Decision Function (SDF) disables SecureXL. QoS disables SecureXL (for R77.10 and above, refer to sk98229). Applies only to TCP services whose 'Protocol Type' is set to 'HTTP' or 'None'. Delayed Synchronization is disabled if the 'Track' option in the rule is set to 'Log' or 'Account'. Delayed Synchronization is performed only for connections matching a SecureXL Connection Template. It is possible that a connection will exist in the Firewall Connections Table, but not in the SecureXL Connections Table (partial connection). Performance Pack Administration Guide (R75, R75.20, R75.40, R75.40VS). Performance Tuning Administration Guide (R76, R77) - Chapter 1 'Performance Pack'. CoreXL - A performance-enhancing technology for Security Gateways on multi-core processing platforms. CoreXL enhances Security Gateway performance by enabling the CPU processing cores to concurrently perform multiple tasks. 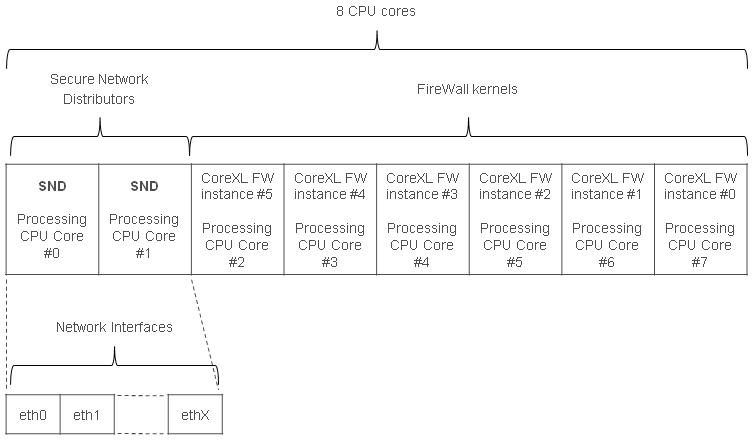 Firewall Instance / FW Instance - On a Security Gateway with CoreXL enabled, the Firewall kernel is replicated multiple times. Each replicated copy, or Firewall Instance, runs on one CPU processing core. These FW instances handle traffic concurrently, and each FW instance is a complete and independent Firewall inspection kernel. When CoreXL is enabled, all the Firewall kernel instances on the Security Gateway process traffic through the same interfaces and apply the same security policy. Affinity - Association of a particular network interface / FW kernel instance / daemon with a CPU core (either 'Automatic' (default), or 'Manual'). Note: The default CoreXL interface affinity setting for all interfaces is 'Automatic' when SecureXL is installed and enabled. Medium path (PXL) - Packet flow when the packet is handled by the SecureXL device, except for IPS (some protections) / VPN (in some configurations) / Application Control / Content Awareness / Anti-Virus / Anti-Bot / HTTPS Inspection / Proxy mode / Mobile Access / VoIP / Web Portals. The CoreXL layer passes the packet to one of the CoreXL FW instances to perform the processing. This path is available only when CoreXL is enabled. Note: The real number of CoreXL FW instances depends on the current CoreXL license. The number of IPv4 FW instances - from a minimum of 2 to a number equal to the maximal number of CPU cores on the Security Gateway. The number of IPv6 FW instances - from a minimum of 2 to a number equal to the number of IPv4 FW instances. The number of IPv6 FW instances cannot exceed the number of IPv4 FW instances. The total number of IPv4 FW instances and IPv6 FW instances together cannot exceed 32. Number of CoreXL FW instances must be identical on all members of the cluster because the state synchronization between members is performed per CoreXL FW instance (e.g., Instance #2 on Member_A can synchronize only with Instance #2 on Member_B). Note: Member with higher number of CoreXL FW instances will enter the 'Ready' state. Refer to sk42096 - Cluster member is stuck in 'Ready' state. sk61701 - CoreXL Known Limitations. Firewall Administration Guide (R75, R75.20, R75.40, R75.40VS) - Chapter 'CoreXL Administration'. Performance Tuning Administration Guide (R76, R77) - Chapter 'CoreXL Administration'. SMT (Simultaneous Multi-Threading - Intel® HyperThreading, or Intel® HT) is a feature that is supported on Check Point appliances running Gaia OS. When enabled, SMT doubles the number of logical CPUs on the Security Gateway, which enhances physical processor utilization. When SMT is disabled, the number of logical CPUs equals the number of physical cores. SMT improves performance up to 30% in NGFW software blades such as IPS, Application & URL Filtering and Threat Prevention by increasing the number of CoreXL FW instances based on the number of logical CPUs. SMT is supported by R77 release and later. SMT is supported only on Security Gateways running Gaia OS with 64-bit kernel. SMT is supported only on Check Point appliances. SMT is relevant only if CoreXL is enabled. When SMT (HyperThreading) is enabled, the number of available CPU cores is not linear. Today, each network interface card has one traffic queue that is handled by one CPU at a time. Since the Secure Network Distributor (SND) - SecureXL and CoreXL Distributor is running on the CPU cores that handle the traffic queues, user cannot use more CPU cores for acceleration than the number of network interface cards passing the traffic. Multi-Queue is an acceleration feature that lets the user configure more than one traffic queue for each network interface card, which allows using more CPU cores for acceleration. rx queue - Receive packet queue. 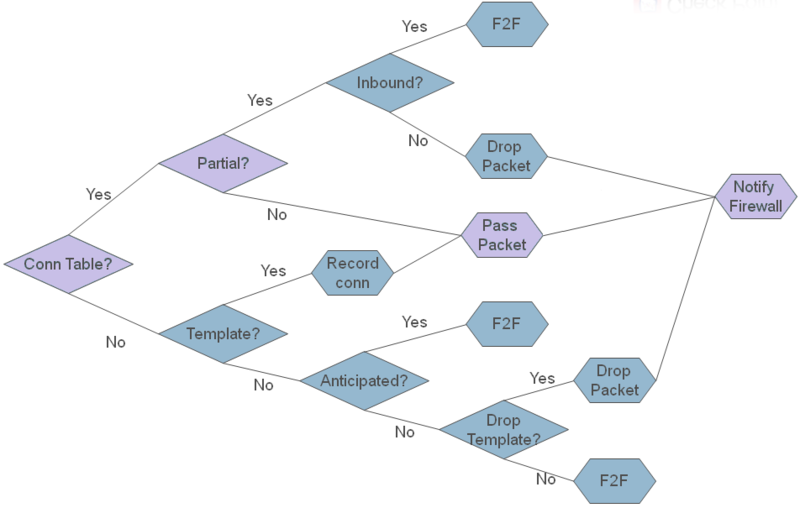 tx queue - Transmit packet queue. IRQ affinity - Process of binding a network interface card's IRQ to one or more CPU cores. Firewall path / Slow path - Packet flow when the SecureXL device is unable to process the packet (refer to sk32578 - SecureXL Mechanism). The packet is passed on to the CoreXL layer and then to one of the CoreXL FW instances for full processing. This path also processes all packets when SecureXL is disabled. Multi-Queue is integrated into R76, R77 and above. For lower versions, a Multi-Queue hotfix has to be installed (refer to sk80940). Multi-Queue is supported on Check Point Appliances (including IP Series Appliances) and on Open Servers. Multi-Queue is supported only on machines that run SecurePlatform OS or Gaia OS. Multi-Queue is supported only for network interface cards that use igb (1 GbE) and ixgbe (10 GbE) drivers. Multi-Queue is relevant only if SecureXL is enabled. Multi-Queue is relevant only if CoreXL is enabled. Multi-queue is not supported on machines with a single CPU core. Multi-Queue allows to configure a maximum of 5 interfaces (due to IRQ limitations). Performance Tuning Administration Guide (R76, R77) - Chapter 3 'Multi-queue'. sk80940 - Multi-Queue hotfix for Security Gateway. Refer to the list of Certified Network Interfaces. You should use the PCI Express (PCIe) cards, because they have better performance than PCI-X cards. If you are using a motherboard with multiple PCI or PCI-X buses, make sure that each Network Interface Card is installed in a slot connected to a different bus. If you are using more than two Network Interface Cards in a system with only two 64-bit/66Mhz PCI buses, make sure that the least-used cards are installed in slots connected to the same bus. If the traffic rate is very high and causes high amount of SoftIRQ (and traffic drops on interfaces), consider increasing the sizes of receive/transmit buffer on network interface cards as described in sk42181 - How to increase sizes of buffer on SecurePlatform/Gaia for Intel NIC and Broadcom NIC. SmartDashboard - open Security Gateway object. The 'Calculate the maximum limit for concurrent connections' should be set to 'Automatically'. Note: Manual limit should be set only for security reasons. The 'Calculate connections hash table size and memory pool' should be set to 'Automatically'. In the 'Calculate the maximum limit for concurrent connections', select the 'Manually' (recommended setting is 'Automatically'). You should ensure that the total number of concurrent connections is appropriate to the TCP end timeout. Too many concurrent connections will adversely affect the Security Gateway's performance. This formula is used to understand what number of concurrent connections a session rate test will generate. It is very hard to predict the maximal connections capacity of a Security Gateway because of multiple varying factors. Administrator should monitor the memory utilization on Security Gateway after changing these settings. Only the maximal (possible) session rate should be considered. This formula will not predict connections capacity, which is stated in Check Point datasheet documents. Average session rate can be obtained using the sk101878 - CPView Utility - from 'Traffic' tab. Additional information can be obtained based on sk67560 - How to export History Report from SmartView Monitor - from 'Traffic' view. TCP timeout varies highly between applications and protocols (e.g., SSH is usually long, HTTP is usually short). TCP end timeout - determines the amount of time a TCP connection will stay in the FireWall Connections Table (id 8158) after a TCP session has ended. UDP virtual session timeout - determines the amount of time a UDP connection will stay in the FireWall Connections Table (id 8158) after the last UDP packet was seen by the Security Gateway. SmartDashboard - go to 'Policy' menu - click on 'Global Properties'. If you are testing large subnets that are directly connected to the Security Gateway without a router. If 'kernel: neighbour table overflow' appears repeatedly in /var/log/messages files and in the output of the 'dmesg' command. Enable SecureXL NAT Templates per sk71200 - SecureXL NAT Templates. Either decrease the TCP end timeout to 2 seconds (SmartDashboard - 'Policy' menu - 'Global Properties' - 'Stateful Inspection'). Or increase the hash size of SND's Connection Table by increasing (permanently per sk26202) the value of the kernel parameter fwmultik_gconn_tab_hsize from the default 524288 to 8388608 and rebooting the machine. Important Note: This change reduces the capacity for the maximum number of concurrent connections. Note: This section does not take the CoreXL into consideration. If your BIOS supports CPU clock setting, then make sure that the BIOS is set to the actual CPU speed (no over-clocking). If your BIOS supports Hyper-Threading, then refer to "SMT (HyperThreading)" section. Each NIC should be bound (affined) to a separate CPU core using the 'Static' affinity mode (run the 'sim affinity -s' command). Pairs of interfaces carrying significant data flows (based on network topology) should be assigned to pairs of CPU cores on the same physical CPU processor. Pairs of interfaces that serve the same connections (based on network topology) should be assigned to pairs of CPU cores on the same physical CPU core. For systems with 4 CPU cores and Dual Port NICs, the IRQ Swizzling technology should be enabled to properly distribute IRQs among 4 CPU cores. Note: Applies only to Dual Port NICs. IRQ Swizzling is not required with Quad Port NICs. For systems with 8 CPU cores and Quad Port NICs, the EIRQ technology should be enabled to properly distribute IRQs among all 8 CPU cores. Note: At the time of this writing, there is no certified platform with this ability. Available in R75.40 and above. Accelerated Drop Rules protect the Security Gateway and site from Denial of Service attacks by dropping packets at the acceleration layer (SecureXL). The drop rules are configured in a file on the Security Gateway (using the 'sim dropcfg <options>' command), which is then offloaded to the SecureXL device for enforcement. Note: There is no relation between the rules being configured in the file and the rules configured in SmartDashboard. Refer to sk67861 - Accelerated Drop Rules Feature in R75.40 and above. Available in R76 and above. Allows SecureXL to accelerate dropped traffic. Once the feature is enabled, dropped traffic is accelerated depending on traffic drop rate per second. Once drop rate matches the thresholds, feature is dynamically activated/deactivated. Refer to sk90861 - Optimized Drops feature in R76 and above. Either disable the synchronization of non-critical connections (e.g., UDP DNS, ICMP). Or (if connection must be synchronized) start synchronizing the connection only some time after its initiation (right-click on the service - 'Edit...' - 'Advanced...' - check the box 'Start synchronizing [X] seconds after connection initiation' - install policy). Note: This section does not take the SecureXL into consideration. It is very important to verify that the CPU cores are equally utilized (run the 'top' command). If this is not the case, you should consider changing the distribution of the Secure Network Distributors (SNDs) and CoreXL FW instances. Under normal circumstances, it is not recommended for the SND and a CoreXL FW instance to share the same CPU core. When using a machine with exactly two cores. It is better for both SNDs and CoreXL FW instances to share CPU cores, instead of allocating only one CPU core to each. When you know that almost all of the packets are being processed in the Accelerated path, and you want to assign all CPU cores to this path. If the CoreXL FW instances do not process significant amount of traffic, then it is appropriate to share the CPU cores. On machines with exactly two CPU cores (both SNDs and CoreXL FW instances use the same CPU cores). For tests, in which traffic is accelerated by SecureXL (if it is enabled). If you replaced the CPU on the machine to a CPU with more/less CPU cores than the previous CPU, then you must reconfigure the number of CoreXL FW instances in the 'cpconfig' menu. In a cluster environment, changing the number of CoreXL FW instances should be treated as a version upgrade - member with higher number of CoreXL FW instances will enter the 'Ready' state. Refer to sk42096 - Cluster member is stuck in 'Ready' state. To change the number of CoreXL FW instances, schedule a maintenance window and follow either a Minimal Effort Upgrade procedure, or a Zero Downtime Upgrade procedure from the Installation and Upgrade Guide (R75, R75.20, R75.40, R75.40VS, R76, R77 Gaia, R77 Non-Gaia). Note: Run the 'fw ctl affinity -l -r -a -v' command to see the current distribution. To change the distribution of the SND, CoreXL FW instances, and daemons, change the current affinities of interfaces and/or of daemons. To make the affinity settings persistent, edit the '$FWDIR/conf/fwaffinity.conf' file on Security Gateway (see the contents of the file for the correct syntax). To apply the configuration from the '$FWDIR/conf/fwaffinity.conf' file on-the-fly (without reboot), execute the '$FWDIR/scripts/fwaffinity_apply' shell script on Security Gateway (see the contents of the script for available flags). To ensure CoreXL's efficiency, all traffic must be directed to CPU cores that are running as SNDs (CPU cores that are not running CoreXL FW instances). Therefore, if you change affinities of interfaces and/or daemons, you will need to accordingly set the number of CoreXL FW instances and ensure that the CoreXL FW instances run on other CPU cores. It is recommended to allocate an additional CPU core to the FWD daemon if the Security Gateway is performing heavy logging. Note: Avoiding the CPU cores that are running the SND is important only if these CPU cores are explicitly defined as affinities of interfaces. 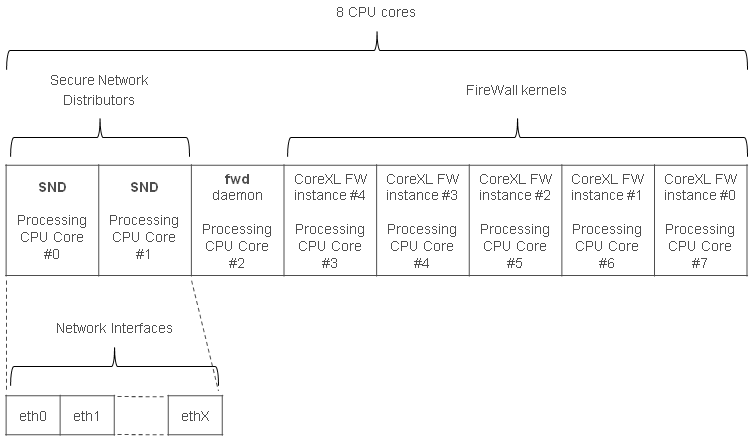 If interface affinities are set to 'Automatic', any CPU core that is not running a CoreXL FW instance can be used for the FWD daemon, and interface traffic will be automatically diverted to other CPU cores. When most of the traffic is accelerated by SecureXL (run 'fwaccel stats -s' command), the load on CPU cores that run as Secure Network Distributor (SND) can be very high, while the load on CPU cores that run CoreXL FW instances can be very low. This is an inefficient utilization of CPU capacity. Traffic is processed by the CoreXL FW instances only when the traffic is not accelerated by SecureXL (if SecureXL is installed and enabled). With CoreXL, there are cases when performance without SecureXL is better than with it, even when SecureXL does manage to accelerate part of the traffic. 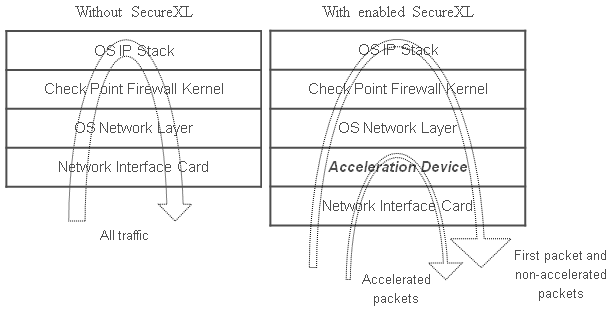 Accelerated path - The packet is completely handled by the SecureXL device. It is processed and forwarded to the network. Medium path (PXL) - Packet flow when the packet is handled by the SecureXL device, except for IPS (some protections) / VPN (in some configurations) / Application Control / Content Awareness / Anti-Virus / Anti-Bot / HTTPS Inspection / Proxy mode / Mobile Access / VoIP / Web Portals. The CoreXL layer passes the packet to one of the CoreXL FW instances to perform the processing. This path is available only when CoreXL is enabled. Firewall path / Slow path - The SecureXL device is unable to process the packet (refer to sk32578 - SecureXL Mechanism). The packet is passed on to the CoreXL layer and then to one of the CoreXL FW instances for full processing. This path also processes all packets when SecureXL is disabled. If SecureXL is enabled - the default affinities of all interfaces are 'Automatic' - the affinity for each interface is automatically reset every 60 seconds, and balanced between available CPU cores based on the current load. If SecureXL is disabled - the default affinities of all interfaces are with available CPU cores - those CPU cores that are not running a CoreXL FW instance or not defined as the affinity for a daemon. If SecureXL is enabled - the affinities of all interfaces are handled by the 'sim affinity' command. Interface affinities are automatically distributed among CPU cores that are not running CoreXL FW instances and that are not set as the affinity for any daemon. If SecureXL is disabled - interface affinities are loaded at boot based on the $FWDIR/conf/fwaffinity.conf configuration file (if SecureXL is enabled, then lines beginning with "i" in this file are ignored). Note: Press digit 1 (above the letter Q) to display all CPU cores and press Shift+W to save this configuration. SMT is not recommended if only FireWall/VPN blades are used, because performance improvement by SMT is achieved on NGFW software blades. SMT is not recommended for environments that have high memory utilization. Reason: Firewall consumes memory for traffic inspection. If the memory utilization is already very high before enabling the SMT, the performance will decrease noticeably because SMT adds more CoreXL FW instances. Reason: Each of these blades might have high memory consumption. These blades run Security Servers that are executed per CoreXL FW instance. Since SMT adds more CoreXL FW instances, overall memory consumption on Security Gateway might increase considerably. SMT is not recommended for environments that use Hide NAT extensively. Reason: An entire range of ports for Hide NAT is divided between the current CoreXL FW instances. The more CoreXL FW instances are running, the less ports for Hide NAT will be available for each CoreXL FW instance. As a result, if one CoreXL FW instance is handling a high number of NATed connections, its port range may get exhausted, while at the same time, other CoreXL FW instances may have enough available ports for Hide NAT. Run the tool for at least 24 hours. Run the 'cpsizeme -S' command. Select "Show summary of last successful session" (to see the summary of the collected statistics). Check the "Estimated average of NAT connections:" counter. If you have two ports on 12600/12700/12800, 13500/13800 and 21000 appliances to handle most of the traffic, it is also recommended to enable Multi-Queue feature to increase SMT performance (refer to Performance Tuning Administration Guide (R76, R77) - Chapter 3 'Multi-queue'). When most of the processing is done in CoreXL - either in the Medium path, or in the Firewall path (Slow path). Network interface cards must support Multi-Queue. Examine the CPU affinity (for interfaces (SND) and for CoreXL FW instances). Decide if more CPU cores can be allocated to the Secure Network Distributor (SND). Refer to sk32578 - SecureXL Mechanism to allow more connections to be accelerated by SecureXL. Place most used rules at the top - use the Hit Count in the SmartDashboard (R75.40 and above) and SmartView Monitor ('Top' view). Related solution: sk72860 - How to reset the 'Hit Count' in SmartDashboard. Note: the new column-based matching of Gateways of version R80.10 and above eliminates this need. In addition, you can provide a full Connections Table from your Security Gateway to Check Point Support for thorough analysis (run the command 'fw tab -t connections -u > /var/log/Connections_Table.txt'). Create a dedicated IPS profile for each Security Gateway (to fine-tune the performance of each individual Gateway). Note that protections are categorized by performance impact. As such, enabling protections with "Critical" performance impact will highly increase CPU consumption. Enable / Disable protections depending on your network devices and your needs (do not enable all the available protections). Avoid setting protections to run in "Detect" mode - it might increase CPU consumption (without increasing the security). Identify the protections that consume most of the CPU resources - follow sk43733 - How to measure CPU time consumed by IPS protections. Disable protections that are not needed in your environment. To check, which protections are needed, you may use vulnerability tools (such as Nessus). Set Protection Scope to "Protect internal hosts only" (SmartDashboard - Security Gateway properties - IPS pane). Note: this optimization is no longer needed with the improved IPS mechanism for Gateways of version R80.10 and above. sk92527 - Traffic rate through Security Gateway is decreased significantly when assigning any IPS profile other than 'Default_Protection'. Create as specific rules as possible, to prevent the unwanted traffic from hitting the wrong rule. Avoid using "Any" in "Source" and "Destination" columns. In the "Destination" column, use the default "Internet", unless a specific destination has to be explicitly selected (e.g., in case of internal servers). There is no need for "Clean Up" rule at the bottom (because the behavior of Application Control & URL Filtering Blades is different from that of the Firewall Blade). Such rule should only be used for short period of time and only for logging purposes. Remove the "Any - Any - Allow" rule, if such rule exists (because the behavior of Application Control & URL Filtering Blades is different from that of the Firewall Blade). Go to "Check Point Online Web Service" section. In the "Website categorization mode" section, select "Background" (to prevent latency due to packet holding until categorization is completed). There is no need for "Clean Up" rule at the bottom (because the behavior of Anti-Virus & Anti-Bot Blades is different from that of the Firewall Blade). Select the relevant profile - click on 'Edit...' button. Go to 'General Properties' pane. In the 'Performance Impact' field, select 'Low'. Consider excluding networks, whose traffic does not have to be inspected - follow sk92515 - How to configure Anti-Virus Exceptions. Note: Standard exceptions are still being inspected (i.e., CPU is consumed), however the traffic will be allowed. The exceptions per sk92515 are completely excluded from the Anti-Virus & Anti-Bot engine inspection (i.e., decrease the load on CPU). Consider disabling MD5 check and GZIP inspection - follow sk94056 - When Anti-Virus and Anti-Bot blades are enabled, RAD process and DLPU process consume CPU at high level. Go to 'Anti-Virus Settings' pane. In the 'Archives' section, uncheck the box 'Enable Archive scanning (impacts performance).'. Displays the CPU utilization (and many other counters). Refer to sk101878 - CPView Utility. Related solution: sk116740 - "top" command on VSX Gateway shows that FWK process consumes CPU at more than 100%. [Expert@HostName]# cat /proc/interrupts | grep -E "CPU|eth"
Related solution: sk115072 - How to determine amount of installed RAM on Check Point Appliance. Displays the Memory utilization (and many other counters). Refer to sk101878 - CPView Utility. Important related solution: sk110351 - Traffic latency on VSX Gateway if MTU larger than 4096 (Jumbo Frames) is configured on an interface. Displays the traffic and interfaces statistics (and many other counters). Refer to sk101878 - CPView Utility. Takes values of 0,1,2,3,... The lower the value, the more leverage it has. This parameter has significance only while routing packets. For example, if you have two Ethernet cards and you want to forcibly make your machine use one card over the other in sending the data. Then you can set the Metric value of the Ethernet card which you favor lower than that of the other Ethernet card. Under "Active Internet connections" look at "Recv-Q" and at "Send-Q"
Displays the SecureXL status and statistics (and many other counters). Refer to sk101878 - CPView Utility. "Accelerator Status" should be "on"
"Accept Templates" should be "enabled"
"Cryptography Features" section appears only if SecureXL device supports cryptography, or if a VPN Accelerator card is installed on the machine. The higher the ratio of "PXL pkts/Total pkts" is, the more packets passed in Medium path. Meaning, packets were handled by the SecureXL device, except for IPS / Application Control / Anti-Virus / Anti-Bot processing. The CoreXL layer passed the packets to one of the CoreXL FW instances to perform the processing. This path is available only when CoreXL is enabled. The higher the ratio of "QXL pkts/Total pkts" is, the more packets were processed by QoS. [Expert@HostName]# cpd_sched_config print | grep -A 5 "Sim_Affinity"
Displays the CoreXL status and statistics (and many other counters). Refer to sk101878 - CPView Utility. Look at the counter steal - Percentage of time spent in involuntary wait by the virtual CPU or CPUs while the hypervisor was servicing another virtual processor. Download the package that contains the 'pstack' utility and special Check Point shell script that collects the necessary information. Transfer the package to the problematic machine (into some directory, e.g., /some_path_to_pstack/). Note: there is no need to restart any service or to reboot the machine. Determine the PID of the problematic daemon (that consumes the CPU at high level) - run the top command and look at the left-most column 'PID'. Important Note: It might take 10-15 minutes for the script to complete the analysis - please wait patiently. Note: This tool is for 32-bit OS - if running Gaia OS in 64-bit, then first you have to switch to 32-bit kernel and reboot. Contact Check Point Support to get the 'valgrind' utility and relevant instructions. Transfer the package to the problematic machine (into some directory, e.g., /some_path_to_valgrind/). After collecting the required information with the 'valgrind' tool (wait for the confirmation from Check Point Support), this tool has to be removed from the machine for security reasons (because this tool is able to collect internal information from the processes). When a command / daemon is started under 'valgrind', 'valgrind' loads all the relevant library files to read the relevant information from them (to know how to collect the memory data). This process (loading of library files) takes time and might cause the CPU load to increase up to 100%. Therefore, schedule a maintenance window to start the 'valgrind'. After 'valgrind' loads all the library files, it does not cause the additional load on CPU. Do NOT KILL the 'valgrind' - it will NOT be able to save the collected data. Refer to 'Collect_Relevant_Information.txt' file inside the package. To correctly stop and start the daemons using the WatchDog, refer to sk97638 - Check Point Processes and Daemons. [Expert@HostName]# cpwd_admin stop -name FWM -path "$FWDIR/bin/fw" -command "fw kill fwm"
Note: Wait for several minutes for 'valgrind' to write its summary report. Instead of manually parsing the highly verbose /proc/slabinfo file manually, it is recommended to use the /usr/bin/slabtop program. By default, output is sorted by the number of objects (column "OBJS", which is equal to using the "-so" option). Recommended output sort is by the cache size of the slab (column "CACHE SIZE", use the "-sc" option). Monitor Security Gateway's resources utilization during this test - Memory, CPU, Interfaces, how traffic is passing, etc. In the "Ip" section, look at "incoming packets discarded"
In the "Icmp" section, look at "ICMP messages failed"
In the "Tcp" section, look at "bad segments received"
In the "Udp" section, look at "packet receive errors"
Search for lines with "error", "fail", "timeout", "loss", "lost"
287 packets to unknown port received. Check every line that contains "error", "drop", "buffer", "fail"
Refer to sk98722 - ATRG: SecureXL. Refer to Performance Pack Administration Guide (R70, R71, R75, R75.20, R75.40, R75.40VS) - Chapter 'Command Line' - fwaccel stats and fwaccel6 stats. Refer to Performance Tuning Administration Guide (R76, R77) - Chapter 'Performance Pack' - Command Line - fwaccel stats and fwaccel6 stats. The most important data in this output is the value of fwha_conf_flags - it should include the value of 0x1 (i.e., ACTIVE). Refer to sk98737 - ATRG: CoreXL. SecureXL is disabled by the firewall. Please try again later. The installed SecureXL device is not compatible with the installed firewall (version mismatch). The SecureXL device is in the process of being stopped. Please try again later. SecureXL cannot be started while "flows" are active. SecureXL will be started after a policy is loaded. fwaccel: Failed to check FloodGate-1 status. Acceleration will not be started. FW-1: SecureXL acceleration cannot be started while QoS is running in express mode. Please disable FloodGate-1 express mode or SecureXL. FW-1: SecureXL acceleration cannot be started while QoS is running with citrix printing rule. Please remove the citrix printing rule to enable SecureXL. FW-1: SecureXL acceleration cannot be started while QoS is running with UAS rule. Please remove the UAS rule to enable SecureXL. FW-1: SecureXL acceleration cannot be started while QoS is running. Please remove the QoS blade to enable SecureXL. Interface to DOS mitigation techniques in SecureXL. blacklist - Interface to the IP blacklist in SecureXL. config - Interface to DOS mitigation configuration in SecureXL. pbox - Interface to the penalty box policy in SecureXL. rate - Interface to the rate limiting policy in SecureXL. stats - Interface to DOS real-time statistics. tab - Manage DOS tables. whitelist - Interface to the IP whitelist in SecureXL. fwaccel dos blacklist Interface to the IP blacklist in SecureXL..
add - Add IPs to the blacklist. clear - Remove all IPs from the blacklist. get - Print the blacklist. remove - Remove IPs from the blacklist. fwaccel dos config Interface to DOS mitigation configuration in SecureXL. get - View configuration parameters. set - Modify configuration parameters. fwaccel dos pbox Interface to the penalty box policy in SecureXL. whitelist -Interface to the penalty box source IP whitelist in SecureXL. fwaccel dos rate Interface to the rate limiting policy in SecureXL. get - View rule information in the rate limiting policy. In order to delete the current policy, simply install a new policy with zero rules. Interface to DOS real-time statistics. clear - Clear real-time statistics. get - View real-time statistics. get - Print contents of the given DOS table. Interface to the IP whitelist in SecureXL. This whitelist overrides entries in the blacklist. Before using 3rd-party or automatic blacklists, add trusted networks and hosts to the whitelist to avoid outages. This whitelist also unblocks ip options and fragments from trusted sources when the --enable-drop-opts or --enable-drop-frags features are active. For whitelisting of rate limiting policy, refer to the bypass action for the fw samp_policy command. I.e. : "fw samp -a b ..."
To replace the current whitelist with the contents of a new file, use both the -F and -l (or -L) options on the same command line. The whitelist file should contain one entry per line in the format of the -a option. Lines beginning with '#' and blank lines are ignored. fwaccel dos whitelist -L is automatically run at boot time. The file that the -L option loads, does not exist by default. 0x0001 - If set, the packet should be dropped at the end of the inbound processing, if the packet is "cut-through" packet. In outbound, all the packets should ne forwarded to the network. 0x0002 - If set, and the SIM "tcp" feature is enabled (on), then an appropriate notification should be sent whenever a TCP state change occurs (connection established/teared down). 0x0004 - If set, then when encapsulating an encrypted packet (UDP encapsulation), the UDP header's checksum field should be set correctly. If flag is not set, then the UDP header's checksum field should be set to zero. It is safe to ignore this flag if it is set to 0 (i.e., still calculate the checksum). 0x0008 - If set, then when the Connections Table has reached the specified limit, new connections that match a template should not be created and the packet matching the template should be dropped. If flag is not set, the packet should be forwarded to the firewall. 0x0010 - If set, then fragments should be forwarded to the firewall. 0x0020 - If set, then connection creation from templates should be disabled. Connection can still be offloaded to the device. This flag disables only the creation of TCP templates. 0x0040 - Accelerated connections should periodically be refreshed in the firewall through the notification. The refreshing should be done only if this global flag is set. 0x0080 - If set, then connection creation from templates should be disabled. Connection can still be offloaded to the device. This flag disables only the creation of non-TCP templates. 0x0100 - If set, then sequence verification violations should be allowed for connections that did not complete the 3-way handshake process (instead of F2F-ing violating packets). 00x200 - If set, then sequence verification violations should be allowed for connections that completed the 3-way handshake process (instead of F2F-ing violating packets). 0x0400 - If set, then RST TCP packets should be forwarded to firewall. 0x0800 - If set, then Path MTU Discovery should not be enforced for IP multicast packets. 0x1000 - If set, then SIM "drop_templates" feature should be disabled. 0x2000 - Indicates whether Link Selection Load Sharing feature was enabled by the user. 0x4000 - If set, then SecureXL asynchronic notification feature should be disabled. 0x8000 - Indicates that Firewall Connections Table capacity is unlimited. Command is available only on Linux-based OS. Feature is available in R75.40 and above. sim dbg Note: From R80.20 "sim dbg" is deprecated, replaced by "fwaccel dbg". Run this command after the interface status is changed back to 'up' to reset the IRQ affinity for this interface. Performance has improved greatly after this change. In the Application Control & URL Filtering policy, disabled the "Any - Any - Allow" rule. In the Anti-Virus & Anti-Bot configuration, excluded networks, whose traffic does not have to be inspected per sk92515 - How to configure Anti-Virus Exceptions. Relevant outputs were collected during a period of time from Security Gateway with the help of the shell script that runs relevant commands every 1 second. All outputs were analyzed and correlated to each other. Output of 'ps auxwf' command correlated to the output of 'top' command showed that during the spikes of CPU load by 'fw', the CPD daemon calls the 'sim affinity -c' command, which calls a series of Check Point shell script that calculate the current load by running various 'fw ctl' commands. These commands process high amount of data - and this causes the spike in CPU load. To minimize the load caused by IO Waiting, Linux kernel was fine-tuned per sk60703 - IOWait consumes 100% CPU after Security policy installation. SecurePlatform Administration Guide (R75, R75.40, R75.40VS, R76, R77). Command Line Interface Reference Guide (R75, R75.20, R75.40, R75.40VS, R76, R77). sk74520 - What is the SecureXL penalty box mechanism for offending IP addresses? sk62620 - What is the fw_worker_X process? 19 June 2017 Updated definition of "Medium path (PXL)"
11 Oct 2015 Updated definition of "Medium path (PXL)"